AFC Ajax NV’s wonder-kids stunned investors as much as they did soccer fans. 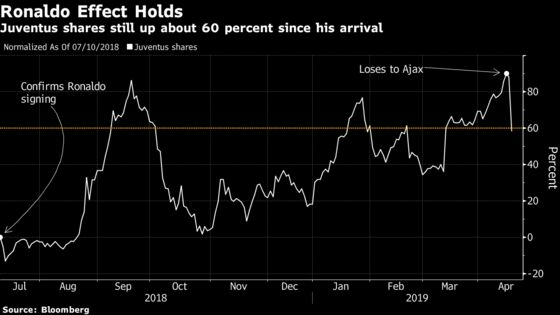 Shares of Juventus Football Club S.p.A. plummeted as much as 24 percent Wednesday, the most since the stock started trading in December 2001, after the Italian team was knocked out of Europe’s elite club competition by the Dutch outsiders. The Amsterdam-based club’s stock soared. 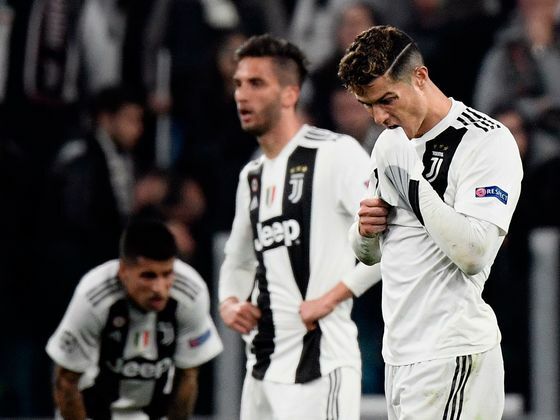 Juventus, whose stock lost about 400 million euros ($453 million) in market value at its low, went ahead in the 28th minute, courtesy of 34-year-old, five-time Ballon d’Or winner Cristiano Ronaldo. But Ajax’s youth prevailed, with goals from two academy players -- 21-year-old Donny van de Beek and 19-year-old Matthijs de Ligt -- to send the club into its first Champions League semi-final since 1997. Ajax now has the chance to boost its annual revenue by more than a third. Reaching the semis has earned it an added 12 million euros in prize money, with another 19 million euros potentially up for grabs if the team progresses further. That’s before ticketing and merchandising revenue, and greater leverage with commercial sponsors for a club that’s earned a place back on global soccer’s biggest stage. Ajax had adjusted revenue of about 92 million euros in 2018, less than a fifth of that earned by Juventus, according to data compiled by Bloomberg. Having a “shoe-string” budget in comparison to Europe’s big guns has left the club dependent on spotting young talent. Fortunately, Ajax is well-experienced in that field, having developed some of the stars of yesterday, like the late Johan Cruijff, and honed the skills of some of the modern game’s best, like Luis Suarez, who could potentially face his old club in the final after FC Barcelona toppled England’s Manchester United last night. The club’s reliance on youth is expected to continue in the coming years, according to Deloitte, who omitted the club from its list of soccer’s 20 wealthiest teams this year. But the bigger clubs are already circling Ajax’s starlets. 21-year-old midfielder Frenkie de Jong, who played all 90 minutes on Tuesday, has already been sold to Barcelona for 75 million euros, and British papers have linked forward David Neres, 22, with a move to the Premier League. “In terms of budget, we are at the bottom of the list in this phase of the Champions League,” Chief Executive Edwin van der Sar, who played as a goalkeeper for both Ajax and Juventus, told AFP earlier this year. “But Ajax is a big name in football,” he said of the side that’s won the tournament four times, but not since 1995. The three other wins came in the seventies when it was known as the European Cup. Van der Sar is not the only former fan-favorite player reminding Ajax’s youngsters of the club’s former glory. The towering Dutchman celebrated in the stands with director of football, Marc Overmars, who played in the final when Ajax won it 24 years ago. For Juventus, it’s a setback for the team backed by the billionaire Agnelli family, whose purchase of Ronaldo last year was seen in part as driven by a desire to win Europe’s top club competition. It’s the first time the Champions League semi-final won’t feature the Portuguese superstar for nine years, according to the statistics website Opta. Juve’s stock had rallied since the quarter-final draw last month as bookmakers made the Turin team known as “La Vecchia Signora,” or “The Old Lady" a firm favorite to progress. The stock soared 17 percent on March 13 after a Ronaldo hat trick turned around a two-goal deficit against Spain’s Atletico Madrid to secure a quarter-final place. Longer-term investors like the Agnellis won’t be licking their wounds just yet. Juventus shares remain up about 60 percent since the Ronaldo signing was announced in July. The Portuguese player’s presence could help triple shirt sales by 2022, while spurring a 60 percent increase in annual sponsorship revenue, analysts at Banca IMI estimated in December. Ajax was 8.5 percent higher at 18.60 euros by 4 p.m. in Amsterdam, valuing the company at 341 million euros. Juventus was down 16 percent at 1.42 euros for a market value of 1.4 billion euros. Juventus’s 175 million euros of bonds maturing in 2024 also fell, declining as much as 2.1 euro cents to 96.56 cents, data compiled by Bloomberg show.